Hotkeys are quite useful to launch specific applications or execute certain actions quickly without the need to go through normal process to run them through Start Menu. If you are one of the them that are looking for ways to simplify application launching, here is a tiny utility, named as Keyboard Tweaker that can assist you to utilize all the buttons combination on your keyboard. Once download and install the software utility, just launch it and you can start using it at no charge. By default, there are already a number of pre-configured Hotkeys that can be used to launch certain programs such as Calculator, command prompt and etc. Users can always customize the settings by browsing for the desired programs that need to be launched via hotkeys. Simply click on ‘Browse’ button followed by the hotkeys combination selection with ‘Alt’, ‘Control’ and/or ‘Shift’ keys together with any character/numeric or even function keys. On top of this, there are some options that allow users to further customize the OSD (On Screen Display) font size, tray icon visibility, autorun with Windows setup and many more. 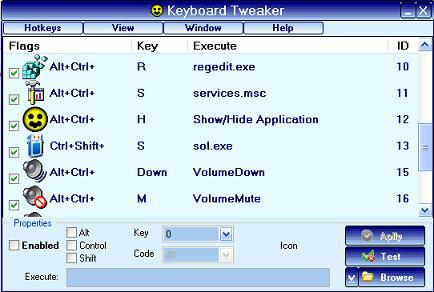 The Keyboard Tweaker is compatible with Windows OS such as 95/98/2000/XP/Vista and could be a good solution especially for those users that emphasize much on efficiency. It can even be more powerful than expensive multimedia keyboards due to its easy use and customizable functionality.